Senator Ted Cruz, R-TX, spoke on the US Senate floor on Tuesday afternoon to speak out in honor of fallen police officers [and all police officers] around this country and he spoke strongly against president Obama's mind boggling nomination of Debo Adgbile's [lawyer and supporter of a convicted unrepentant cop killer] nomination to the DOJ Civil Rights Division. He released a news letter of his press release Tuesday afternoon entitled: "Sen Ted Cruz: Those who lionize convicted cop killers are not suitable for major leadership roles at the US Department of Justice". "In his remarks, the Senator noted that although every criminal defendant is entitled to an attorney, Adegbile’s representation of Mumia Abu-Jamal, a man convicted of murdering Philadelphia police officer Daniel Faulkner in 1981, was pure political advocacy. Abu-Jamal's guilt was not in doubt – four eyewitnesses saw the shooting and Abu-Jamal confessed and stated in front of three witnesses that he hoped that Officer Faulkner died. And although Abu-Jamal already had a team of high-priced volunteer lawyers that had filed dozens of petitions and appeals, Adegbile and his team joined the case in 2009, 27 years after Faulkner’s death, and then began politicizing it. Under Adegbile's supervision, rallies, protests, and media campaigns instead dishonestly portrayed Abu-Jamal as a political prisoner and victim of racial injustice. To read the entire press release please click on Sen Ted Cruz web site here. Update March 5, 2014 @ 12:00 pm: Great breaking news [Wed. morning] from the Washington Times: Eight Democrats joined all the Republicans in the Senate to block Mr. Debo Adegbile's nomination! From the Washington Times: [Adegbile's nomination was stopped] "even after Democrats changed the rules last year to overcome filibusters with just 50 votes — but on Wednesday Majority Leader Harry Reid couldn’t even muster all of his own troops. A furious Mr. Reid hinted that Republicans’ opposition was based on racism, pointing to to several other black nominees that GOP senators had opposed earlier. But in the case of Mr. Adegbile, his defense of Abu-Jamal was too much for even some Democrats. The Senate blocked Mr. Adegbile on a 47-52 vote, with eight Democrats voting along with Republicans for the filibuster". 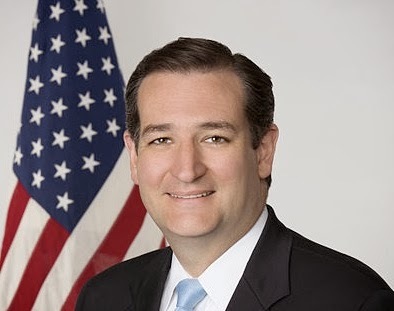 Congratulations and thanks to Senator Ted Cruz for his strong stance and impressive argument carrying the day and stopping this disgusting nomination by the president of the United States.